This article was originally published on April 29, 2011, in the Shenzhen Daily. 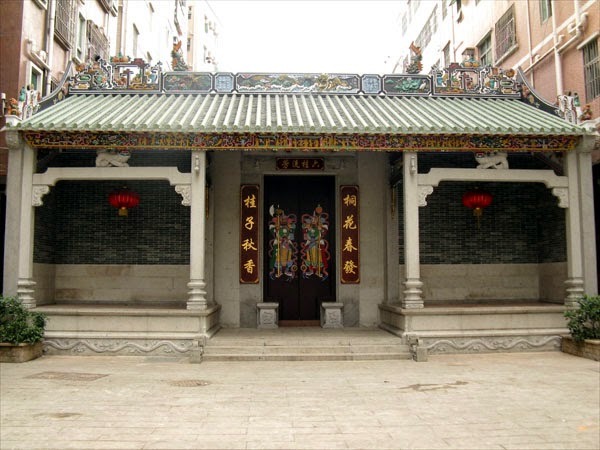 Recently, some friends told me of a new "temple" in Xili's Pingshan Village, not far from the "New Guanyin Temple." I visited the site last week, only to discover that it was not a temple at all, but rather an ancestral hall for the local branch of the Fang family. My friends' mistake was a natural one. Folk temples and local halls share many characteristics, especially on the outside. 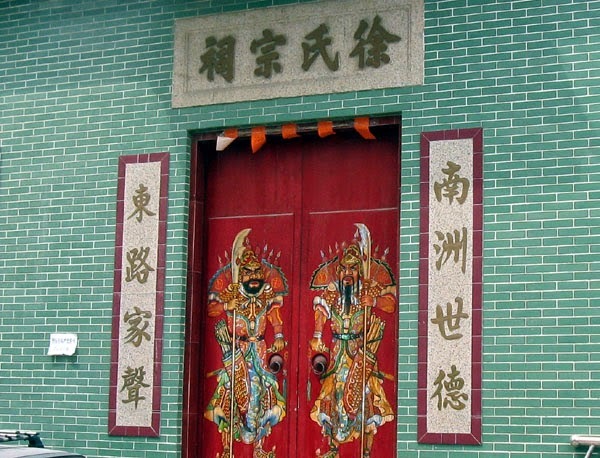 Often, they are laid out with two or three halls; the doors are painted with "men shen" (door gods); and there is a drum platform on either side of the door. Also, the roofs are ornate, with human and animal figures from traditional stories decorating the ridgeline. However, the interior of the building will betray its true purpose. 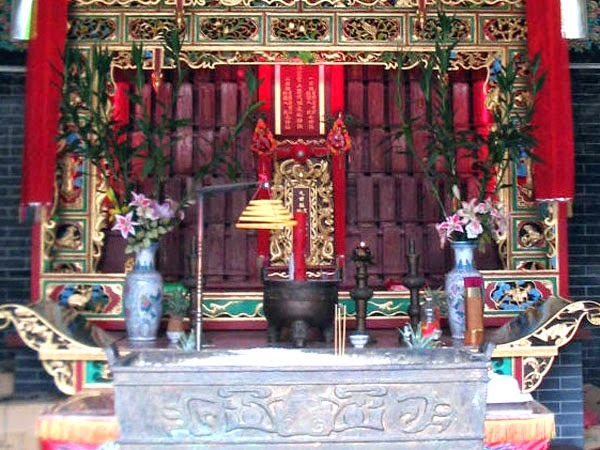 In a folk temple, the "back" wall will feature an altar with one or more gods; in ancestral halls, the altar area will usually feature tablets with the names of prominent ancestors. In addition, the walls of the ancestral hall will usually be decorated with pictures of current clan members and their recent activities. There is another category, the community hall or gongci (公祠; not to be confused with "公司," which means "company" or "corporation"). 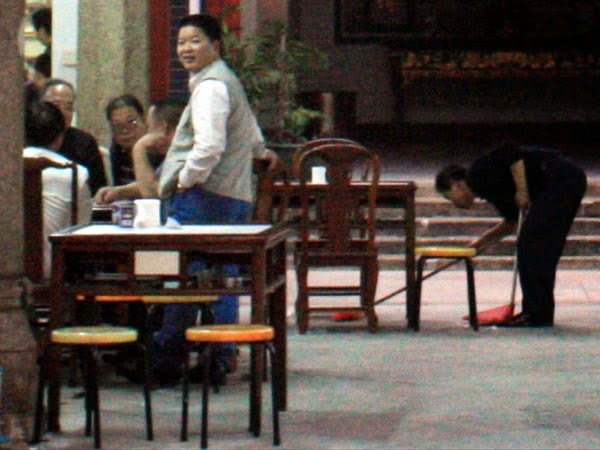 In both types of hall, you'll usually find people chatting, playing mah jongg or cards, or preparing for family- or community-based activities. The difference, then, between a temple and a hall is their purpose: the former is for worship of a god or gods, with a social component; the latter is for social activities, with--in an ancestral hall--occasional veneration of ancestors. You can see the two side by side in many Shenzhen villages; in Futian, try Shangsha, Huanggang, or Shang Meilin villages (more information below).